President Muhammadu Buhari has been accused of failing Nigerians by not fulfilling his campaign promises and bringing back ethnicity which Nigerians felt they had overcome. 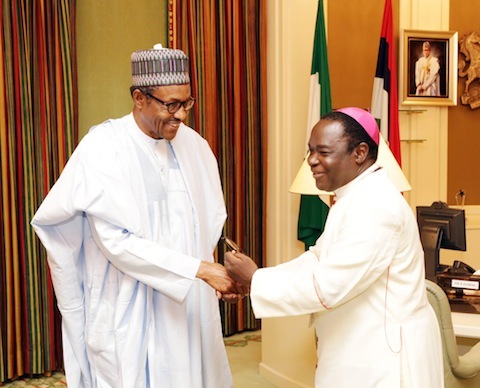 Mathew Kukah, bishop of Sokoto diocese of the Catholic church made the accusation in a letter addressed to President Muhammadu Buhari. According to The Cable, in a letter to the president, the cleric said Nigerians have never been so alienated from one another. Kukah said during his campaign, Buhari promised to fight corruption and make the nation secure but he has fallen short of expectations. He said Buhari needs to connect with Nigerians and fulfil his promises. “You know sir, that you rode into town like a knight in shining armour, carrying the joys, pains, anxieties and fears of a people whose broken dreams had littered and turned the landscape into a kaleidoscopic scenery of desolation and despair,” he said. “In your campaigns, you promised to restore a sense of national pride in us by slaying the dragon of corruption, banishing the retrogressive scourge of Boko Haram, bringing back our daughters from Chibok and making our country and citizens truly safe. “We waited in hope right to the end of the first year, but somehow, amidst some hazy weather, all we heard was the sound of screeching tyres with the plane carrying our hopes seemingly unable to take off. It finally did but we had barely gained altitude when sickness struck and you spent the better part of a year seeking healing. “The nation prayed for you and miraculously, you recovered. Evidently, you had been saved for a purpose. Our prayer is that this realisation will help you understand that you have a date with history and divine judgment. For now, before your eyes and in your hands, our country, our communities, our people are all in a state of stupor. We have never felt so alienated from one another. The bogeyman of religion, region and ethnicity, which we thought we had overcome by the sheer nature of your support base, has come back with a vengeance to haunt and threaten the very foundation of our existence. The bishop also asked politicians to desist from the practice of enriching themselves from the government’s purse. “The average age of governors and legislators across the country is 50. These are the years of dreams, maturity, sacrifice, patriotism and self-giving,” he wrote. “But, sadly, you do not seem ready to depart from the culture of cronyism, prebendalism and primitive accumulation. The result has been ruination and decay. He appealed to Nigerians not to succumb to pressure and allow the rich or the political class divide them. Kukah reminded them that God has plans for all of them. “But you yourself, no matter how rich or poor, how educated or otherwise you are, have a duty to understand that God has plans for you and for every individual and you have a duty to both yourself and your neighbour,” he said. “You have to defend your personal dignity and seek the enforcement of your rights to have property and to raise a family as opposed to waiting for the crumbs from our greedy leaders. “Defend your dignity as human beings and children of God. Do not allow the rich and powerful, who are rich because you are poor, to divide you. “They have light and water in their high fenced houses, not because they are Muslims or Christians or that they are from this or that or the other tribe but simply because they are rich. You are poor, homeless, have no road, no water, and your children are sick and illiterate, not because you are Christian or Muslim or from this tribe or the other, but simply because you are poor.